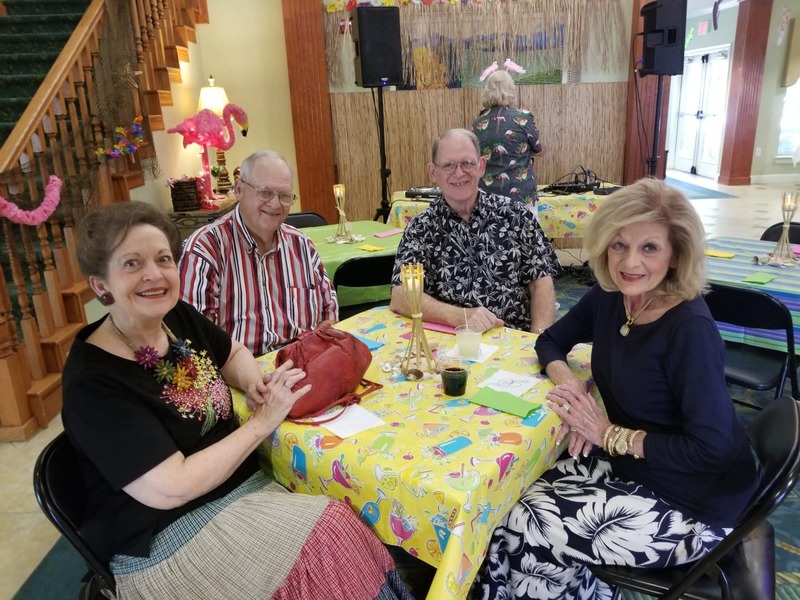 Duncanville chamber members Judy and Grady Smithey with Ray Pursley and Dottie Pennebaker. Thanks to the Duncanville Chamber of Commerce, there’s always something happening in the “City of Champions.” A lively group of chamber members and their friends visited “Margaritaville,” (also known as Champions Cove) for a networking reception from 5-7 p.m. Thursday, July 20. The party was hosted by Champions Cove, 1600 S. Main Street in Duncanville. Champions Cove features apartments for active seniors. Cheryl Baxter is the new executive director of Champions Cove. 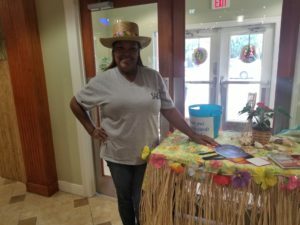 Employees Lena Gail Hoskins and Eva Lozana also participated in planning the party, helping transform the Champions Cove lobby into a tropical paradise. Decorations included pink flamingos and palm trees, while party-goers were entertained with festive Island music by D.J. Mike. The party also featured a buffet spread with yummy food like spicy shrimp cocktail, savory meatballs and sandwiches, and bread pudding. There was also a Margarita bar, all hosted by Shawn Wilson and David’s Seafood Grill. The Duncanville Chamber of Commerce holds a variety of networking events every month. Billed as “Your Partner in Business,” the chamber’s mission is “to promote business and community prosperity through economic, civic and educational programs.” Duncanville native Steve Martin is the Executive Director of the Chamber of Commerce. Tommie Rains, Ambit Energy Consultant, is Chairman of the Board. Chamber networking events include a Networker Luncheon the first Thursday of the month at various locations. 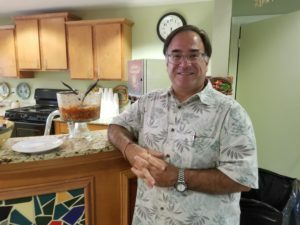 The next luncheon will be Aug. 3 at Osaki Sushi and Hibachi Restaurant, 749 W. Wheatland Road, in the Tom Thumb shopping center. The chamber also holds a monthly chamber luncheon at various locations the second Wednesday of each month. The chamber’s business interchange meetings are held in the chamber offices, 300 E. Wheatland Road, on the third Wednesday of the month at 7:30 a.m. The Fun after Five receptions take place every third Thursday, from 5-7 p.m. at different locations. Special events throughout the year include Taste of Duncanville in March, an annual golf classic in May, and annual Civic Auction in October. A special 9/11 Remembrance Event is also held in September. The chamber’s biggest fundraiser of the year will be September 30 at the Hilton Garden Inn in Duncanville. “Rockin’ the Past and Rollin’ to the Future” will recognize former chairs of the board. Tickets to the gala event, featuring dinner plus music for dancing by Sean Mitchell and the Big City Music Revue, are $100 for individuals. Raffle tickets for a number of prizes are being sold now through the chamber. For more information, contact the chamber at 972-780-4990 or email hilda@duncanvillechamber.org. Another successful, ongoing event managed by the chamber is the Duncan Switch Street Market, which celebrated its third anniversary in April. Named for the railroad switching tracks and the train depot in the center of town, the street market takes place from 9 a.m. to 3 p.m. at the intersection of Main and Center Streets. Shoppers will find arts, crafts, resell items, and food for purchase. Children’s activities and entertainment are also featured.